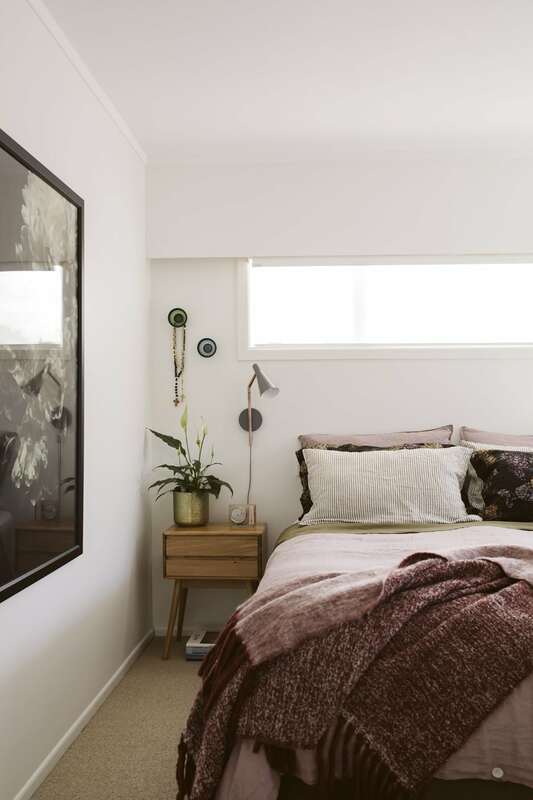 The sense of space in this New Plymouth house made it a must for its owners – all it needed was a few tweaks. It’s been a decade-long debate in the Newbold household: whether to paint the distinctive red brick that makes up the bulk of their home’s structure white – or not? 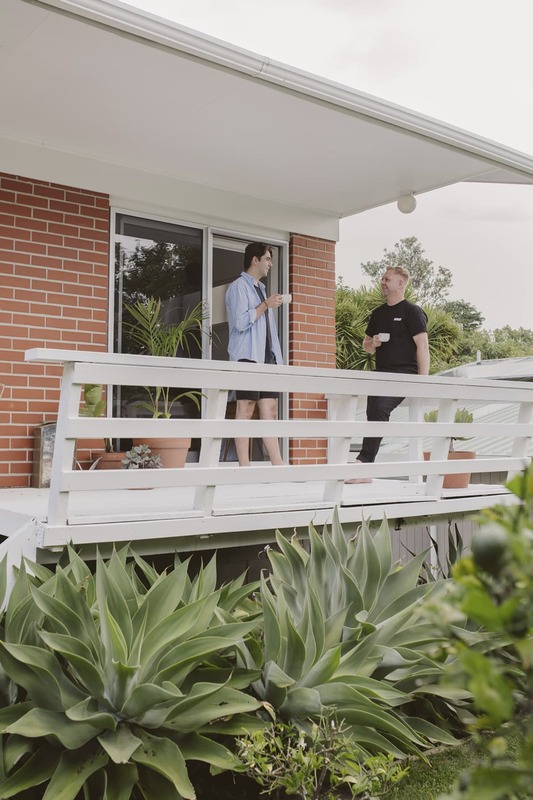 The solidity of the brick was just one reason the New Plymouth couple was attracted to this property Paul Newbold describes as “a 60s/70s mash-up”. the entrance hall, atop which is oneof Fleur’s beloved birds – this one’s from Vintage Industries. Paul is a keen photographer and framed here is an image of Beco do Batman, a famous alleyway of street art in Sao Paulo, Brazil, that he took on a visit last year. 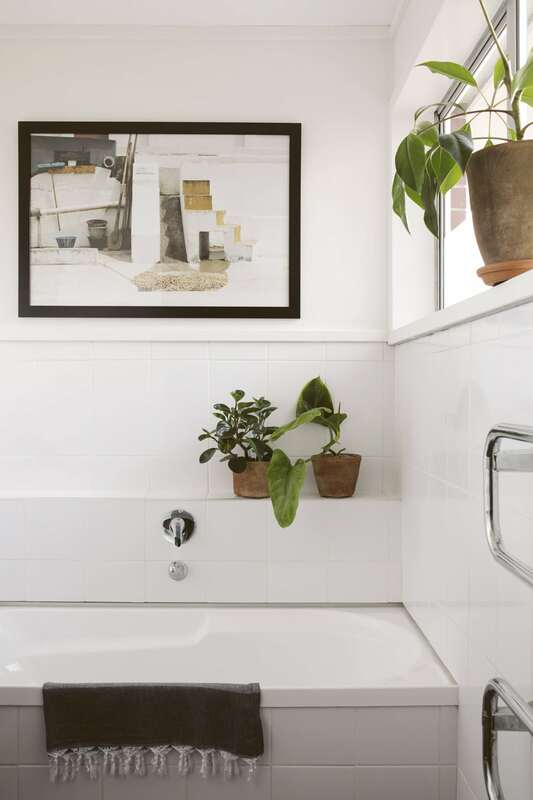 The couple made some changes almost at once, with a can or two of Resene Quarter Villa White at the centre of the transformation. The ‘white-out’ included painting over the peach-toned kitchen and dining area, the deep-green living room and the dark-stained beams on the ceiling. Then they turned their attention to the exterior weatherboards. Little wonder the red brick is now also in the firing line. 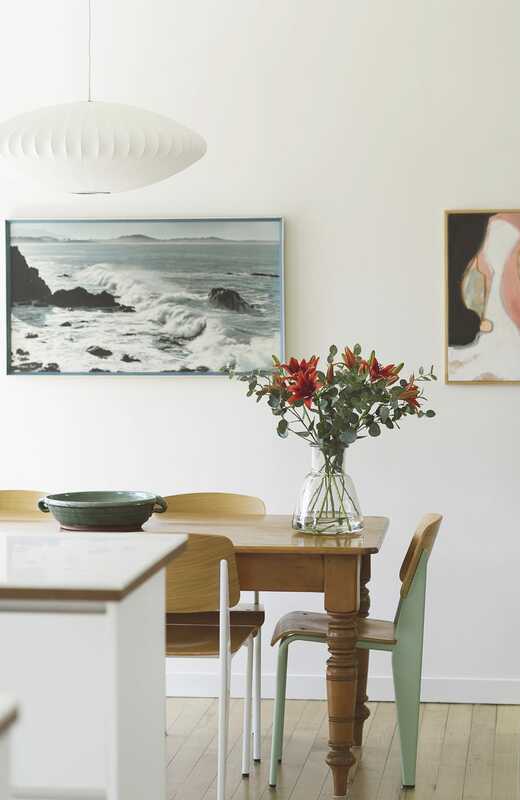 DINING Beside the secondhand kauri table hangs an original Whites Aviation photograph of Kaikoura. 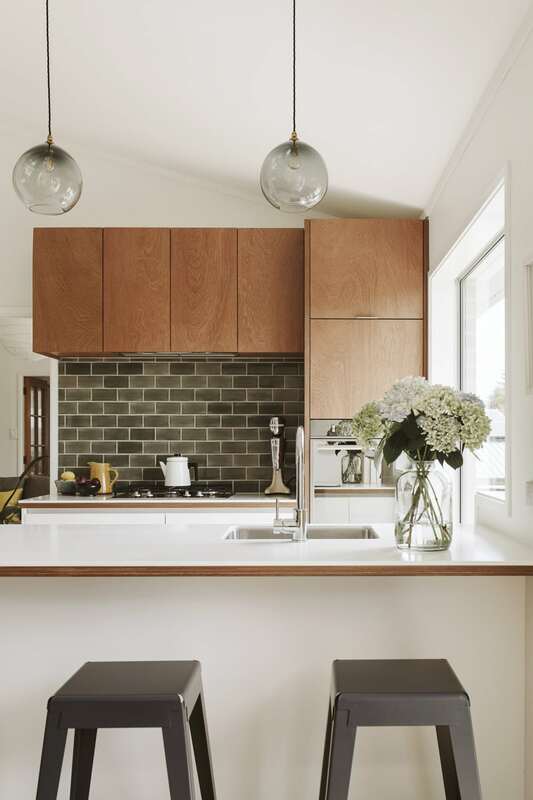 OPPOSITE The new kitchen features a simplified layout and restrained colour palette of timber, green and white. The existing wood panelling was removed and the original floors now complement the cabinetry. The Corian benches are set on a timber- clashed substrate to add warmth and character. The Dome pendant lights are by Monmouth Glass Studio. New curtains and blinds were next on the list, and carpet for the living room. Since the dining zone was already carpeted, they needed a match, so they became super sleuths, and after some research managed to track down the supplier, who had just enough of that style left in his warehouse for the job. LIVING Fleur and Paul have recently reupholstered a pair of wooden-armed mid-century recliners they found in a secondhand store in a delicious mustard-gold velvet. With the basics of redecorating complete, the Newbolds could focus on the furnishings. 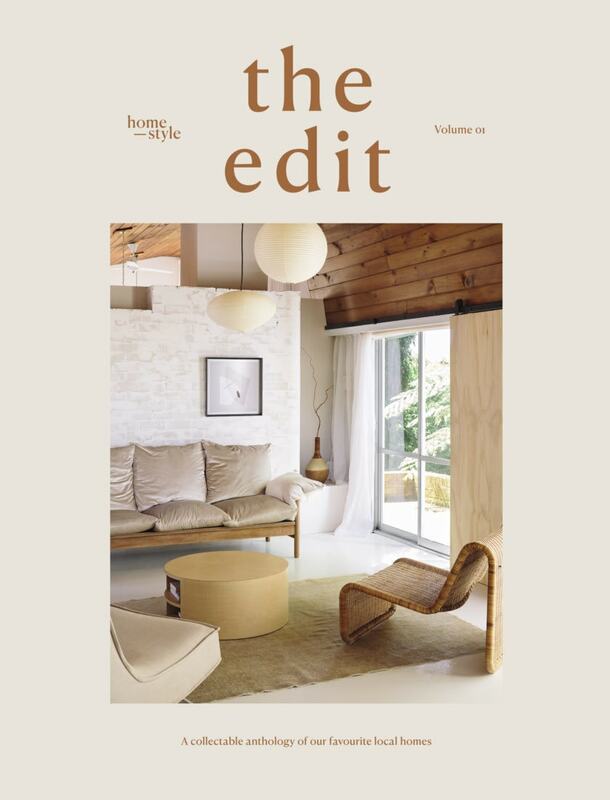 “Over the years we defined our style and we certainly had an end picture in mind,” says Paul. 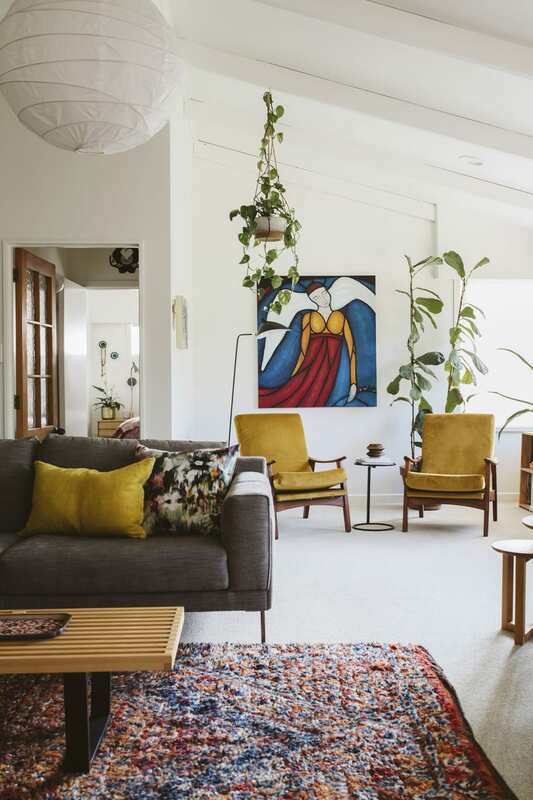 Many pieces fit the mid-century mood of the architecture, while other design touches have 70s provenance, such as the rice-paper orb pendant in the living room and the kauri dining table bought on Trade Me. BATHROOM Fleur and Paul made only minor tweaks to the main bathroom but did replace the tiles. A photograph of Finca La Reforma in Guatemala provides interest. Coffee buyer and roaster Paul makes regular trips to plantations in Central and South America, which Fleur, who loves colourful, artistic textiles, sees as prime opportunities to put her orders in. Some imports include vibrant table runners, ceramic coffee cups and a statue nicknamed ‘Guadeloupe Mary’ which inhabits an alcove in a sideboard made by a joiner friend. In the living area is a magnificent photograph of a parrot, found locally. “I’m mad on birds,” admits Fleur. “Paul has tried to tame that obsession.” Nevertheless, an Eames House Bird and some woodwork versions from the 70s can be found perching on a shelf in the new kitchen nook. 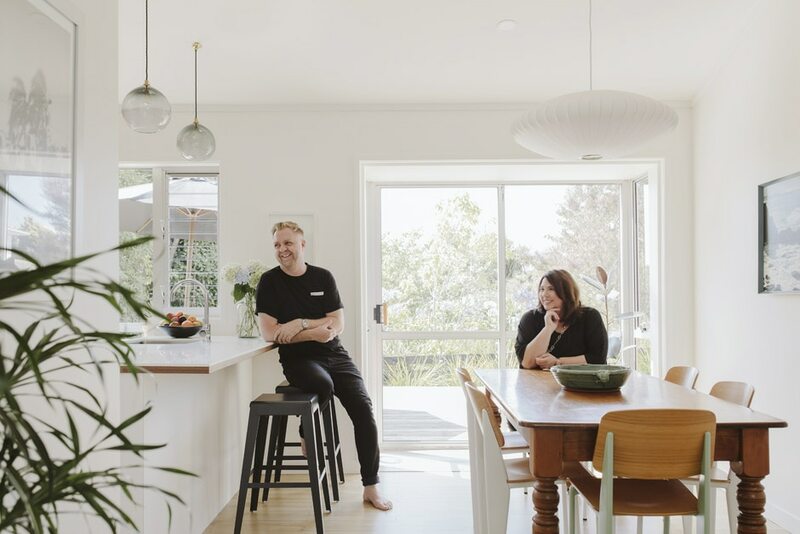 After eight years of living with an 80s kitchen, the couple decided the time was right and asked local designer Annika Rowson to help to create a space that would reflect the era of the house. 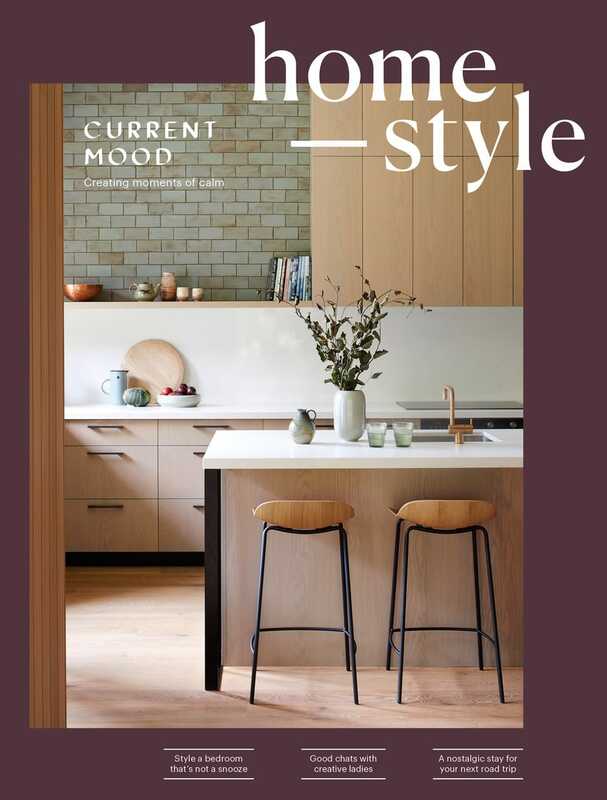 With timber and white cabinetry and green tiled splashbacks, it does this beautifully, and last year won the Creative Small Space award in the National Kitchen & Bathroom Association’s Excellence in Design Awards. The major renovation changed the layout of the space from U-shaped to galley. 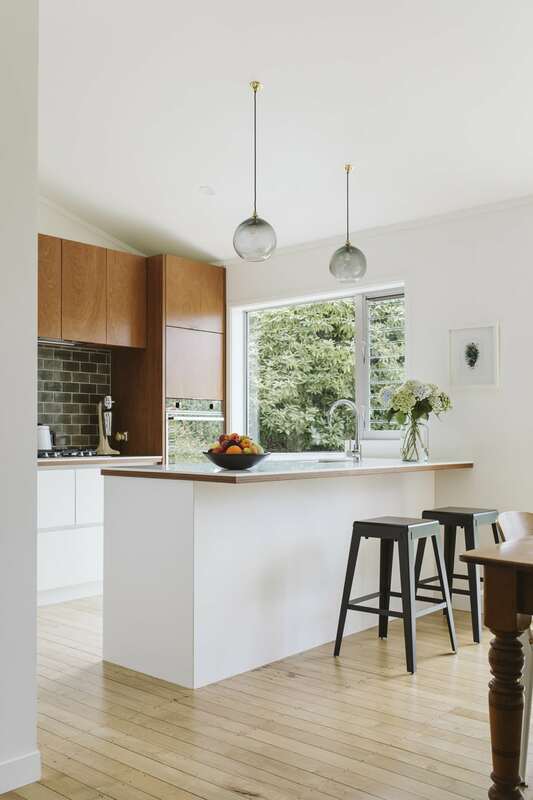 Builder Gareth Shearman of The Makers carefully matched the new floorboards to the original tawa and removed a bay window to replace it with louvres and a picture window that frames a view of the deck and the trees beyond. BEDROOM The master bedroom features linen and a throw by Alex & Corban. A floral theme emerges in the hydrangea-print pillowcases by Thread Design and White Light artwork by Dark Fleur. The blue and green crystal hooks are Jellies coat hangers by Kartell. It’s the openness of the house that ensures the couple – despite their boys having now flown the coop – is more than happy to stay put. “I like to look out to the gardens and see the birdlife, flowers and plants – I never feel like I’m closed in,” says Fleur. EXTERIOR When you’re in the coffee business, you take your morning cuppa seriously. Theo joins Paul for the occasion on the deck off the main bedroom, where giant Agave attenuata are a sculptural presence.